I come across gems in the Indie Industry so often I should be an agent for a publishing house, or create my own one day. 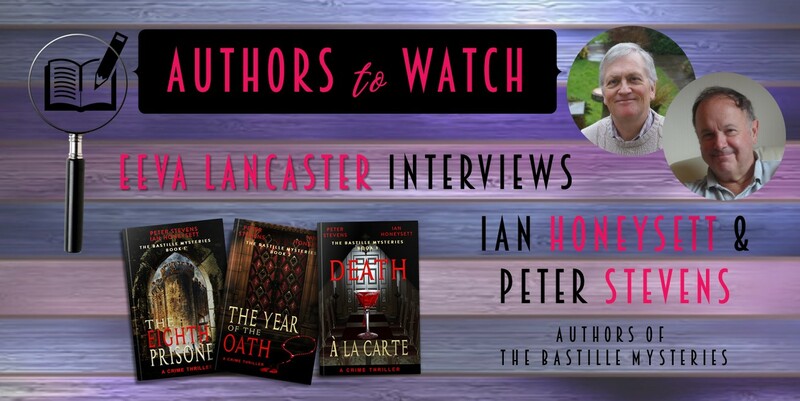 Today on Authors to Watch, I'd like you all to meet two British writers whose works will be enjoyed by crime thriller, murder mystery readers - PETER STEVENS & IAN HONEYSETT - the authors of The Bastille Mysteries. Tell us something about you. Who are you? Pete : I am a Londoner by birth,actually born within the sound of Bow Bells, by residence, almost all my life and inclination - never Tory and never BREXIT. I was educated at a grammar school,but support a fully comprehensive system, took a degree in Business Studies,though History was always the subject I liked the most, as I thought it was the most useful idea. As I specialised in Manpower Studies and ended up working in the Careers Service, it could be seen as the correct decision. I never lost my love of History though and upon my retirement returned to my first preference. I still live in London, in my house in Walthamstow. My long term partner is Liz, whom I have known for 33 years. How and why she stays with me, you’ll have to ask her! Ian : I come from Bromley in Kent : famous for HG Wells - though we never met. I studied History at Oxford and taught for a few years before moving into Careers work,where I met Pete, and then Personnel / Human Resources for various organisation. When I married Jan, we moved to Godalming in Surrey where we have lived for over 30 years. We have 3 children but all have now flown the nest – though we still keep in touch. Since retirement, I’ve taken up writing of course, painting and playing the ukulele as well as travelling as often as possible. 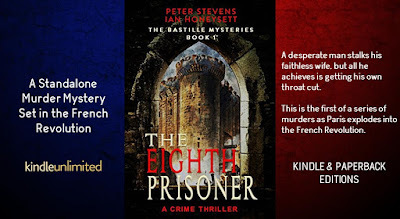 How was your first co-written book, The Eighth Prisoner, conceived? Pete : Several periods of History have fascinated me; one has been the French Revolution, with the world - in Paris at least- changing more in 5 years than in the previous five hundred. Side by side with this interest has been my love of murder mysteries. It seemed a good idea to combine the 2 as far as I could see this period hadn’t been covered by murder mystery writers up to now. I was in contact with my old friend, Ian, who was my fellow writer of revues at college in the 1970s. He wanted to write about a clerical detective; my character was a policeman. A number of real historical characters would also appear regularly. If you are writing about the French Revolution, it makes sense to start with the storming of the Bastille, which is what we did. Ian : The conception / incubation of The Eight Prisoner equalled that of the African elephant at well over a year. I can’t tell you how many phone calls, emails & even meetings we had, to develop the characters and plot. There were plenty of surprises along the way: not least when we discovered that Pete had written his chapters in the past tense and I had written mine in the present! We’ve evened it all out now, of course. Why did you choose the Historical Thriller / Crime Thriller genre? Both : See above. 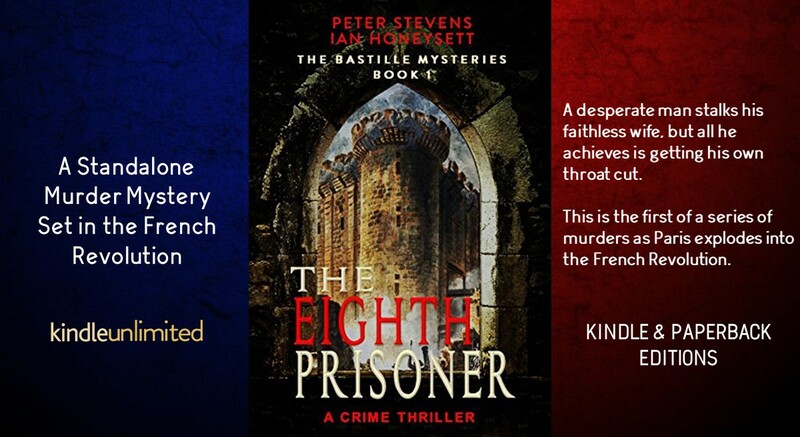 Combining History and Crime Writing appealed to both of us. It had been done before, of course, but not in this particular period of History. Pete : I have always been a fan of Agatha Christie and more recently P C Doherty, although my view of society and History is very different from theirs I suspect. Ian : So many, but my favourites include Conan Doyle, GK Chesterton, Rex Stout and Sam Eastland. What can readers expect when they read The Bastille Mysteries? 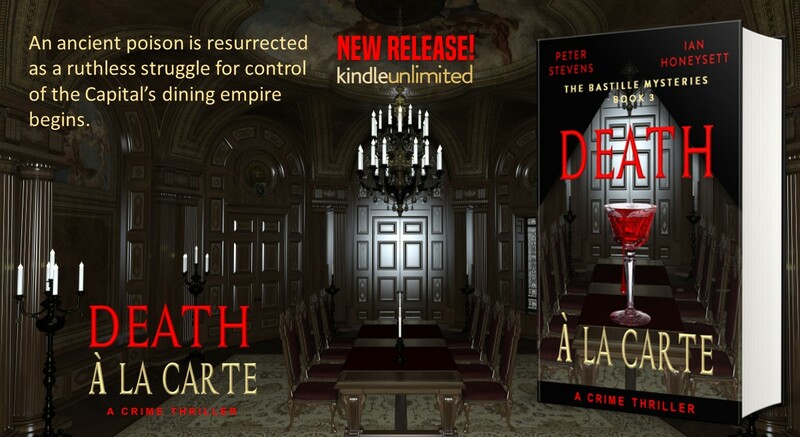 Pete : Fast-paced action most of the time; plenty of murders, intrigue and, I hope a real sense of mystery. We have tried hard not to turn the books into a History lesson, although several friends have told me that they have been motivated to look into the French Revolution and what happened at the time of our books. Hopefully, they will also start sympathising with (some of) our main characters. Each book stands on its own, but I believe readers will get more out of them if they read them in sequence. Naturally it is very hard to write about a period of time such as the French Revolution from a totally neutral viewpoint. You won’t find The Scarlet Pimpernel in our novels. However, I would hope those with a different view of the time could appreciate and enjoy our books as period murder mysteries. Ian : There are plenty of interesting characters too. We’ve stayed faithful to the facts, more-or-less, where real people are involved - such as Georges Danton - but let our imaginations roam with fictional ones such as the formidable Madame Lavotte and the ancient Doctor Dernes with a twinkle in his eye. Both : eBook on Amazon and the print on Createspace. We have a free book on Smashwords, The Odd Fellow, which you can also download free on our website, if you don't have an Amazon account. 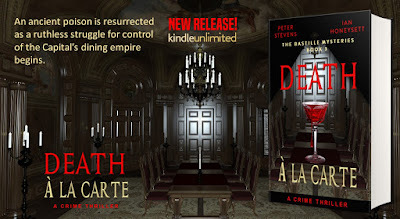 Both : Death A La Carte, the third in the series, has just been released. The fourth Bastille book, Dead Radical, which completes the first cycle of the series, will be published probably soon after Christmas. Work has started on the second cycle which will see the Revolution start its second, more radical and bloody phase. But, don’t worry, plenty of room for individual, private murders though. Pete : The actual writing. My favourite part is the plots. We start off with a real idea as to how the storyline will develop but as we write new ideas present themselves. Having a co-author really helps. You have someone to bounce ideas off. We can tell each other what will and won’t work. Research is also enjoyable- for example looking into the history of poisons and poisonings for Death A La Carte. Ian : Once we’ve agreed on the overall plot, we allocate chapters to each other and then comment on each other’s efforts. The fun comes with taking a simple piece of plot and seeing what you can do with it – trying to incorporate twists and turns that often take me by surprise. It frequently takes the other one by surprise too as it doesn’t always turn out as we had agreed! Pete : Buy the books and enjoy! The period is fascinating and there may just be lessons to be learned for today. That said, the books can be enjoyed as out and out murder mysteries. Ian : Immerse yourself in a period you might not know much about but which helped shape our world as few others. And enjoy the murders and mystery as well as the humour! Tell us where we can find you. Thank you for sharing your time with me, Gentlemen.